Upper respiratory infections are quite common in cats. Just like people, cats can come in contact with highly contagious viruses that result in cold and flu like symptoms. A congested cat's symptoms can include coughing, sneezing, runny eyes and, in some cases, labored breathing. Congestion usually is not serious, but kittens and elderly cats are at higher risk and should be taken to a veterinarian right away. The following information will walk you through how to treat a congested cat. Keep your cat dry and warm indoors. Just like humans, cold and dampness can exacerbate respiratory issues. Keeping your cat warm and dry indoors will help encourage the natural healing process. Put blankets in your cat's bed and in places he likes to nap around the house. Stimulate your cat's appetite with wet food. Cats that are congested often lose their appetite. In part, it's because the cat can't smell as well. Wet food tends to have a stronger smell and will entice your cat to eat. It's important that your cat keeps up his strength so that his body can continue to fight off the virus. It is also important that your cat remain hydrated. Keep his bowl full of fresh water to encourage hydration. Get antibiotics for your cat from his veterinarian. 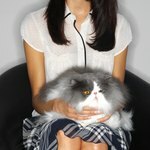 According to VetInfo.com, 90 percent of feline upper respiratory infections are viral. Even though antibiotics won't kill the virus, the medicine will fend off secondary bacterial infections. This is important because your cat will be more susceptible to bacterial infections while its immune system is busy fighting off the virus. Keeping bacterial infections away will help your cat get better faster. In addition, if his eyes look red and irritated, prescription eye drops can also be given to clear up any possible eye infections. Set up a humidifier near your cat's bed. The Maryland SPCA recommends the use of a humidifier to comfort your cat. Similar to humans, cats who are struggling with congestion will have inflamed and painful nasal passages, so increasing the moisture level in the air will reduce some of that irritation. The veterinarians at VetInfo.com also recommend the use of human nasal drops to alleviate some of the discomfort and stuff nose symptoms. Always check with your veterinarian regarding dosage and which over the counter drops are appropriate. Keep your cat's vaccinations up to date. There are several feline diseases that manifest in upper respiratory issues. These diseases can be very serious, especially if left undiagnosed. If your cat is un-vaccinated, missed a booster and is exposed to other cats outdoors or in kennels, please take him to his veterinarian.